The Russian spacecraft has so far failed to set a course for Mars and could re-enter Earth’s atmosphere early in January if engineers are unable to regain control of it. Phobos-Grunt probe. Credits: Ill. Roscosmos. “We have no doubt that the spacecraft will burn up on re-entering the atmosphere,” said Russian space agency chief Vladimir Popovkin, cited by Russian news agencies. The Phobos-Grunt probe was launched last week but remains stuck in Earth orbit as a result of a failure that has prevented it from continuing its journey to Mars’ moon Phobos. Engineers have been trying since to reprogram the spacecraft, so far without success. According to Mr Popovkin, they still have until early December to fire the probe’s thrusters, after which the ballistic Mars departure window will close. “There is still a chance, but we have not been able to receive any telemetry yet to understand what happened,” said Popovkin. “I would like to be able to announce positive results, but space is a complicated business and this kind of thing happens,” he added. 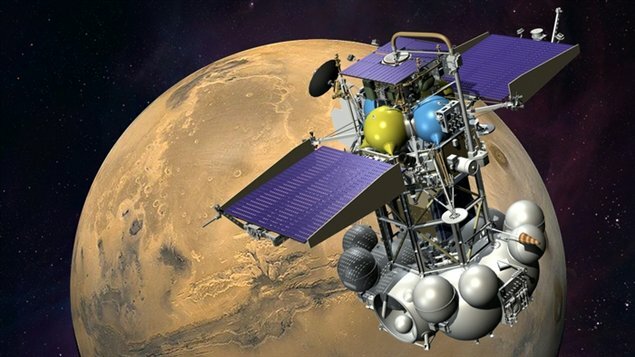 The failure of Phobos-Grunt also dooms the first Chinese mission to Mars, since the probe was to have placed the Yinghuo-1 satellite into orbit around the red planet to study its surface and magnetic field. This probe was Russia’s first attempt at an interplanetary exploration mission since the loss in November 1996 of the Mars 96 mission, which fell into the Pacific Ocean. Phobos-Grunt was also carrying several French experiments to study Phobos’ soil.